Milan is the second largest city in Italy and has 1.3 million inhabitants. This world-famous fashion metropolis is ideal for exploring by rental car—the city centre itself should be avoided, however, due to the high volume of traffic. With DriveBoo, you can compare offers of different car rental companies in Milan and book a rental car online. Enjoy the advantages of independent travelling and arrive quickly and easily at your destinations. Where can I rent a car in Milan? Whether in the city itself, at one of the three airports - Malpensa (MXP), Linate (LIN) and Orio al Serio (BGY) - or at the central station, you will find numerous car rental companies. Depending on where you start your journey, you have many options available to you. Take advantage of DriveBoo and get a detailed overview of the providers and available vehicles. Are there any toll roads in Milan? In Milan, since 2012, there has been a city toll within the city ring "Cerchia dei Bastioni". A day ticket costs 5 euros. The fee is charged on weekdays between 7.30am and 7.30pm. Tickets are available at Milan's transport services outlets and newspaper and tobacco shops. Do I need a vignette for my rental car? Vignettes are not needed in Italy. The billing of the road toll is not a flat rate—it is always calculated at the end of each stage. As a rule, you take a ticket from a toll booth at the entrance of a road. This must be paid when you leave the road. Where can I park my rental car for free in Milan? In the city centre, parking is charged almost everywhere. It is free only within the white-marked parking zones. Blue parking zones are chargeable, yellow parking zones are reserved for residents with parking permits and pink parking zones are for pregnant women and people with children. Parking is prohibited on all of the black-yellow and yellow marked curbs. What are the speed limits in Italy? In Italy, there are fewer traffic controls than in most Western European countries, but they still exist. In addition to the conventional speed controls, Italy has the so-called "tutor" control system, which determines an average speed with several measurements along the way. All of the measuring points are always marked. Exceeding the speed limits can be quite expensive. If you drive up to 20 km/h above the permitted speed, you will have to pay at least 150 euros and if you drive more than 50 km/h too fast, you can be fined over 530 euros! On the highway and outside urban areas, you must drive with your low beam or daytime running lights on at all times. If you are caught driving without your lights on, you will have to pay a fine of 41 euros. In addition, it is mandatory to carry a safety vest. In Italy, there are strict traffic rules and heavy fines. Therefore, it is advisable to always follow the guidelines closely. How much are traffic tickets in Italy? What insurance is recommended for a rental car in Milan? Full insurance without non-waivable excess in case of an accident, damage or theft is always recommended. Rental car liability insurance with sufficient coverage is also compulsory. Do I have to pay a higher deposit in Milan? It is the norm all over the world to pay a deposit before you drive off in a rental car. Compared to other countries, deposits in Italy are very high. A deposit of €2,000 for a compact car is not uncommon. You must therefore present a valid credit card at the time of hiring—this will be charged the amount of the deposit. Make sure that the credit limit of your card is sufficient to cover the deposit. Examine the car carefully during the pick-up and have every scratch confirmed in writing. This is the only way to prove that you have not caused any damage when returning the car. If you plan to share the driving between two of you, it is necessary to register the additional driver. You can do this online or on site. Otherwise, your insurance would only be valid if the registered driver was behind the wheel. Many car rental companies include an additional driver for free. Sometimes a small fee is charged. An online comparison is definitely advisable. What phone numbers should I know while driving in Italy? What are the best highlights of Milan? 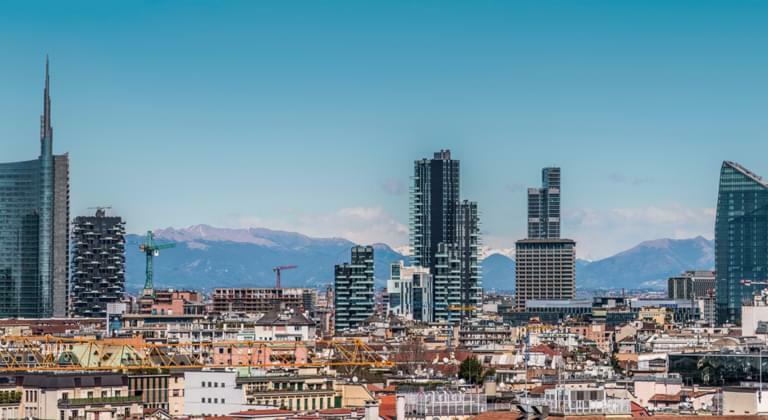 While the best way to explore Milan's historic centre is on foot, it is well worth renting a car in order to take a trip around the city's surrounding areas. You can, for example, go for a swim to Lake Como, nestled between the high mountains of the Alps. The enchanting city of Verona, known as the setting of Romeo and Juliet, is also an ideal trip destination. Another exceptionally beautiful spot is the hilltop town of Bergamo, east of Milan.